Objectives This study aimed to develop consensus on an internationally agreed dataset for juvenile dermatomyositis (JDM), designed for clinical use, to enhance collaborative research and allow integration of data between centres. Methods A prototype dataset was developed through a formal process that included analysing items within existing databases of patients with idiopathic inflammatory myopathies. This template was used to aid a structured multistage consensus process. Exploiting Delphi methodology, two web-based questionnaires were distributed to healthcare professionals caring for patients with JDM identified through email distribution lists of international paediatric rheumatology and myositis research groups. A separate questionnaire was sent to parents of children with JDM and patients with JDM, identified through established research networks and patient support groups. The results of these parallel processes informed a face-to-face nominal group consensus meeting of international myositis experts, tasked with defining the content of the dataset. This developed dataset was tested in routine clinical practice before review and finalisation. Results A dataset containing 123 items was formulated with an accompanying glossary. Demographic and diagnostic data are contained within form A collected at baseline visit only, disease activity measures are included within form B collected at every visit and disease damage items within form C collected at baseline and annual visits thereafter. Conclusions Through a robust international process, a consensus dataset for JDM has been formulated that can capture disease activity and damage over time. This dataset can be incorporated into national and international collaborative efforts, including existing clinical research databases. Juvenile dermatomyositis (JDM) is associated with significant morbidity and mortality.1–3 To better understand this rare disease,4 international collaboration is essential. This is feasible with the development of national and international electronic web-based registries and biorepositories.5 6 For good clinical care and to aid comparison of data between groups, it is crucial to have a common dataset that clinicians and researchers collect in a standardised way, with items clearly defined. The International Myositis and Clinical Studies (IMACS) Group7–9 and Paediatric Rheumatology International Trials Organisation (PRINTO)10–12 JDM core sets were developed predominantly for research studies. Existing myositis registries include partially overlapping but different dataset items, making comparison between groups challenging.13 This study aimed to define optimal items from existing datasets that would be useful to collect in routine practice, within accessible disease-specific registries, that, when measured over time, would help capture disease outcome/treatment response, which would facilitate both patient care and translational research. The study protocol and background work have been published.13 14 The study is registered on the Core Outcome Measures in Effectiveness Trials initiative database.15 The Core Outcome Set—STAndards for Reporting standards for reporting were followed.16 The study overview is shown in figure 1. Flow chart showing study overview. A steering committee (SC) developed a prototype dataset by scrutinising all items within existing international databases of juvenile-onset myositis (JM) and adult-onset myositis,1 17–19 informed by a literature search and detailed analysis of the UK Juvenile Dermatomyositis Cohort Biomarker Study and Repository (JDCBS).13 19 Leading representatives of each partner organisation9 12 17 20 21 detailed in the study protocol14 approved the template/provisional dataset. This study design aimed to employ representation from healthcare professionals with experience in myositis working as physicians, allied health professionals or clinical scientists in paediatric or adult medicine within rheumatology, neurology or dermatology14 and consumers (patients with JM and their parents or carers). A two-stage Delphi process was undertaken.14 Items contained within the prototype dataset were listed and further modified by the SC to ensure clarity. The items were formatted into a custom-made electronic questionnaire, piloted before distribution. After modifications, the Delphi template included 70 items with an additional 53 conditional on previous response (detailed in online supplementary table S1). Participation was invited via membership lists of IMACS, Childhood Arthritis and Rheumatology Research Alliance (CARRA), Juvenile Dermatomyositis Research Group (JDRG) UK and Ireland, Paediatric Rheumatology European Society (PReS) JDM working party and PRINTO Centre Directors. These are representative of international paediatric rheumatology and myositis specialty groups, capturing opinion of clinicians, scientists and allied health professionals. The estimated membership of these groups totals more than 1000. However, the majority of members belong to more than one organisation and membership lists include retired/non-active members or specialists working in adult-onset myositis potentially less inclined to answer a paediatric-specific survey.14 Participants were asked to rate the importance of each item for clinical practice and separately for value in research, using a scale of 1–9: 1–3 (of low importance), 4–6 (important but not critical) and 7–9 (critical).14 An option of ‘unable to score’ was given and free text comments were allowed. Delphi 2 was sent to participants who scored 75% or more of the items in round 1 of the Delphi. Each participant was asked to re-score each item, having been shown the distribution of scores for the group as a whole and their own score. The healthcare professionals’ survey was modified into separate parent and patient questionnaires as per protocol,14 formatted for computer or paper format completion. The questionnaires and age-appropriate information leaflets were reviewed by patient and public involvement coordinators and by parent/young people’s focus groups.14 The focus groups also reviewed patient/parent-reported outcome measures (PROMs) used for JDM and other rheumatology conditions,22–27 and opinions were summarised (online supplementary table S2). Thirty items were included in patient/parent questionnaires; 23 from adaptation of the Delphi (combining or simplifying items from the healthcare professional questionnaire and selecting items particularly relevant to patients/parents), 2 additional questions added by the SC to determine patient/parent perspectives on collecting and storing information, plus 5 questions suggested by patients/parents within focus groups (online supplementary table S1). The scoring system was simplified into three categories of ‘not that important’, ‘important’ and ‘really important’. An option of ‘unable to score’ was given and free text comments were allowed. Participation was open to any patient with JM—child/adult, or any parent/carer of a child with JM. Patients with adult-onset myositis (onset ≥18 years) were excluded. Information leaflets and questionnaires were in English only; translators could be used if available. Patients/parents were signposted to the study via email distribution lists/websites of North American and UK patient support groups (Cure JM and Myositis UK),28 29 the lead of the JDRG patient/parent groups and JDRG coordinator.20 In addition, following site-specific ethics approval, UK centres participating in the JDCBS19 30 and a Netherlands site invited patients/parents to participate. For each item, the number and percentage of participants who scored the item and the distribution of scores (grades 1–9) were summarised for each stakeholder group. Consensus definitions were applied as ‘consensus in’ versus ‘equivocal’ or ‘consensus out’ according to predefined consensus definitions (table 1). Eighteen voting delegates were invited to a 2-day consensus meeting, led by a non-voting facilitator (MWB). International representatives were experts in myositis from paediatric rheumatology/myositis groups and professionals who care for patients with myositis including neurologists, dermatologists, adult rheumatologists and physiotherapists. Prior to the meeting, delegates were sent a summary of results to review. 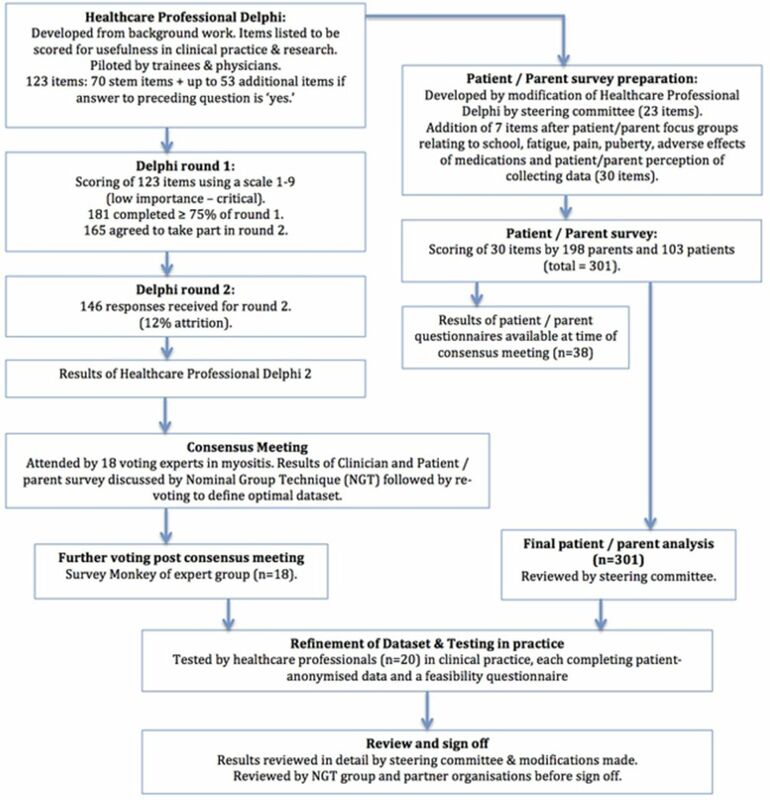 During the consensus meeting, Delphi 2 results and patient/parent results were presented for each item—as shown in online supplementary figure 1. Items achieving ‘consensus in’ within the Delphi and patient/parent questionnaires were voted on immediately. Those not achieving ‘consensus in’ were discussed by nominal group technique. Consensus was defined a priori as ≥80% (table 1). Discussion and re-voting allowed refinement of items or associated definitions. The process continued until consensus was reached or until it was clear that consensus would not be reached. The proposed dataset was formatted into three sections (forms A, B and C) and tested in clinical practice. Members of the expert group were asked to test the dataset themselves and/or delegate a member of their department unfamiliar with the dataset. Clinicians completed patient-anonymised data on one to two patients under their care and a feasibility questionnaire (online supplementary table S3). Feedback was considered by the SC and refinements made. The dataset was sent to the expert group, including representatives of partner organisations (IMACS, CARRA, PRINTO, PReS JDM working group, JDRG, Euromyositis) for comment. Two hundred and sixty-two healthcare professionals accessed the system (26% of the estimated total membership of specialty groups). 181/262 (69%) completed ≥75% of Delphi 1 (June–September 2014). One hundred and sixty-five agreed to take part in Delphi 2 (November 2014–January 2015); from these, 146 replies were received (12% attrition). One hundred and seventy-two participants provided full demographic data in round 1 showing that survey responses were received from Europe (44%), North America (34%), Latin America (12%), Asia (6%), Australia/Oceania (0.5%), Middle East (3%) and Africa (0.5%). Respondents primarily were paediatric or adult rheumatologists (85%) or had an interest in rheumatology (8%), but also included clinical academics (specialty not defined, 4%), dermatologists (0.5%), neurologists (0.5%), physiotherapists (1%) or other professionals (1%). The majority of respondents had substantial experience in the specialty (74% with ≥10 years of experience) and worked within paediatrics/mainly paediatrics (82.5% vs 17.5% of respondents working with adults). Responses were summarised as percentages of participants ranking items as critical for decision-making (score 7–9) for each item (clinical/research), shown in online supplementary table S1. Availability of investigations to clinicians within clinical practice was also summarised from responses received in Delphi 1 (online supplementary table S4 and online supplementary figure S1). In total, 301 surveys were completed (198 from parents, 103 patients). To allow time for sufficient data capture for parent/patient questionnaires, data collection continued after the consensus meeting. At the consensus meeting, data were available from 16 completed patient surveys and 22 parent surveys. Decisions made at the consensus meeting with 38 responses still held true in the final analysis of 301 replies. Responses were received from Europe (53%), North America (44%) and other continents (3%). Patients completing the questionnaire were a median of 15 years of age (IQR 12–17). Parents completed questionnaires for children who had a median age of 11 years (IQR 7–15). Overall, there was good agreement between patient/parent surveys and the healthcare professionals’ Delphi and items agreed at the consensus meeting (online supplementary table S1). Key exceptions are summarised in table 2. All invited experts (n=18) attended the consensus meeting (Liverpool, March 2015), representing Europe (n=10), North America (n=6), Latin America (n=1) and Asia (n=1). Specialties included paediatric rheumatology (n=13), adult rheumatology (n=2), paediatric dermatology (n=1), paediatric neurology (n=1) and physiotherapy (n=1). Parents/patients were not included. Output from the consensus meeting is shown in online supplementary table S1. A set of recommendations for first visit, for each visit and for annual assessment was made. Refinement took place following the consensus meeting via three rounds of SurveyMonkey, principally to better define myositis overlap features and disease damage items (shown in online supplementary table S1), with the same members of the expert group (100% response rate). Glossaries of definitions/instructions to aid completion, along with muscle strength-testing sheets, were formulated into appendices, approved by the SC. Twenty clinicians tested the dataset (October 2016–April 2017); eight were present at the consensus meeting, three had completed the Delphi and nine were new to the dataset. Time taken to complete the dataset in clinical practice ranged from 5 to 45 min (median time 15 min). In addition, 15/20 (75%) found the dataset helpful in practice. Feedback was reviewed in detail by the SC and refinements made. The resulting optimal dataset is summarised within tables 3–5 representing three forms. They consist of 123 items: 12 (plus 6 items conditional on responses to the initial 12) within form A, to be completed at first/baseline data entry only; 56 (plus 20 conditional on responses to the 56) within form B, to be completed at every clinic visit representing status of the patient at the current time point; and 55 (plus 15 conditional on responses to the 55) within form C, to be completed at baseline and then annually to capture disease damage. The complete dataset with glossary of definitions and muscle strength-testing sheets can be found in the website of University of Liverpool (http://ctrc.liv.ac.uk/JDM/) and online supplementary table S5. An internationally agreed JDM dataset has been designed for use within a clinical setting, with the potential to significantly enhance research collaboration and allow effective communication between groups. The accompanying glossary of definitions may be particularly helpful to those in training or physicians less familiar with JDM and for standardisation of the information. Key items are included within the dataset that allow documentation of disease activity and damage with the ability to measure change over time. If adopted widely, the dataset could enable analysis of the largest possible number of patients with JDM to improve disease understanding. It is anticipated that further ratification of the dataset will take place when incorporated into existing registries and national/international collaborative research efforts. It is acknowledged that updates may be needed in the future to incorporate advances in JDM. When tested in practice by a small number of clinicians, the forms took between 5 and 45 min to complete. The wide range is likely to be due to some respondents interpreting this question as time taken to complete the actual forms, while others may have documented time taken to complete all the tasks within the forms, including clinical examination. It is likely that completion time will be reduced as clinicians become familiar with the questions over time and employment of electronic data entry systems. The dataset does not encompass every aspect of a clinic consultation. Other factors such as adverse effects to medication or details of pain (ranked important by patients/parents) should be covered as part of standard care. This study is limited by the fact that patient/parent questionnaires were available in English only, reducing the number of countries that could contribute; hence, there is low patient participation outside of Europe and the USA. Complete data from patient/parent surveys were not available at time of the consensus meeting. However, reanalysis of outcomes after the close of the patient/parent survey showed that decisions made at the consensus meeting still held. Initial response rate to Delphi 1 was low (estimated at 26% of potential specialty group membership). However, not all members of the respective organisations contacted would be expected to answer a paediatric-specific survey as described previously. Response rates and attrition between Delphi 1 and 2 were as expected from paediatric rheumatology studies with similar methodology.44–46 Despite inclusion of neurology and dermatology experts in the consensus meeting, the participants of this study were primarily rheumatologists. The consensus-driven dataset developed in this study, like IMACS and PRINTO core sets, includes physician and patient/parent global activity, each of which is included in recently defined response criteria for minimal, moderate and major improvement in JDM.8 IMACS measures muscle strength using Manual Muscle Testing, whereas CMAS is used within the PRINTO core set. Both were retained in the consensus dataset. Both tools have been found to have very good inter-rater reliability (when summary scores are used)22 and either is allowed in the recently defined American College of Rheumatology/European League Against Rheumatism–approved response criteria.8 The overlap between the IMACS/PRINTO core sets and items contained within the consensus dataset is unsurprising as all core sets aim to capture and measure disease activity and damage over time. A key difference is that the consensus dataset does not use specific tools to record disease activity, such as the Myositis Disease Activity Assessment Tool or the DAS, but rather uses disaggregated items, each of which has been evaluated by a multistage consensus-driven process that considered value for both clinical use and research. The dataset was developed with a key aim for it to be incorporated into existing registries, allowing comparison of data between groups. The already available web-based Euromyositis registry, www.euromyositis.eu, is free to use in clinical practice and for research and includes a JDM proforma, which will be modified where needed to include items in this new dataset. Likewise, at the time of writing, the CARRA Registry is in the final stages of adding JDM (https://carragroup.org/) and will include the items contained in this consensus dataset. The JDCBS (https://www.juveniledermatomyositis.org.uk/) aims to incorporate this dataset as far as possible. Research priorities defined during the consensus meeting included the need to further develop skin assessment tools that are practical within a busy clinical setting, develop an abbreviated muscle assessment tool that removes redundant items from a combined Childhood Myositis Assessment Scale and Manual Muscle Testing and to further develop PROMs so that they are applicable to JDM and acceptable to patients. Through a robust international consensus process, a consensus dataset for JDM has been formulated that can capture disease activity and damage over time. This dataset can be incorporated into national and international collaborative research efforts, including existing clinical research databases and used routinely while evaluating patients with JDM. We would like to acknowledge the Euromyositis Research Steering Committee for their collaboration and impetus for this work, in particular Professor Ingrid Lundberg, Dr Hector Chinoy, Professor Jiri Vencovsky and Niels Steen Krogh. We acknowledge the IMACS, CARRA, PRINTO and PReS working groups for their support and collaboration. We would like to acknowledge the IMACS membership who contributed to this work and the IMACS Scientific Committee for guidance, particularly Dr Rohit Aggarwal, Dr Frederick Miller and Dr Dana Ascherman. We would like to acknowledge the PRINTO Directors who contributed to this work and particularly acknowledge Dr Nicola Ruperto, representing PRINTO. We acknowledge the support of OMERACT and in particular, would like to thank Professor Maarten Boers for his advisory role. We would like to thank the UK Trainees Group and individuals selected by the steering committee for piloting the questionnaire before distribution. We would like to acknowledge our collaborators within the COMET group, in particular, Heather Bagley, Patient and Public Involvement Coordinator. We would also like to acknowledge the help and advice of Professor Bridget Young, Olivia Lloyd and Helen Hanson and the Clinical Studies Group consumer representatives and BSPAR Parent Group, particularly Sharon Douglas. We would like to thank young people from NIHR Young Person’s Advisory Group and the JDM Young Person’s Group, for their advice on patient questionnaires and information leaflets and Hema Chaplin, Patient and Public Involvement and Engagement Lead for the ARUK Centre for Adolescent Rheumatology for facilitating these groups. We acknowledge the support and collaboration of patient/parent support groups, Cure JM and Myositis UK. In particular, we would like to thank these organisations for promoting the patient and parent questionnaires via their websites/email lists. We would like to thank Katie Arnold, Lawrence Brown, Kath Forrest and Karen Barnes for their administrative support for this work. We would also like to thank Eve Smith and Nic Harman for note keeping during the consensus meeting. We would like to thank the following people for testing the dataset in practice: Bianca Lang, Silvia Rosina, Heinrike Schmeling, Krystyna Ediger, Olcay Jones, Latika Gupta, Maria Martha Katsica, Kiran Nistala, Parichat Khaosut, Ceri Turnbull, Joyce Davidson and Megan Curran.
. Clinical features and outcome in a Danish cohort of juvenile dermatomyositis patients. Clin Exp Rheumatol 2010;28:782–9.
. Defining clinical improvement in adult and juvenile myositis. J Rheumatol 2003;30:603–17. National Institutes of Environmental Health and Science. International Myositis Assessment & Clinical Studies Group (IMACS). https://www.niehs.nih.gov/research/resources/imacs/index.cfm (accessed 8 Apr 2017). PRINTO. Paediatric Rheumatology INternational Trials Organization. https://www.printo.it/ (accessed 8 Apr 2017). Core Outcome Measures in Effectiveness Trials Initiative. Development of an internationally agreed minimal dataset for juvenile dermatomyositis (JDM); a rare but severe, potentially life-threatening childhood rheumatological condition. http://www.comet-initiative.org/studies/details/389?result=true (accessed 8 Apr 2017). CARRA. Childhood Arthritis and Rheumatology Research Alliance. https://carragroup.org/ (accessed 8 Apr 2017). Euromyositis. International collaboration research and treatment database for myositis specialists. https://euromyositis.eu/ (accessed 8 Apr 2017). JDRG. Juvenile Dermatomyositis Research Group. https://www.juveniledermatomyositis.org.uk/ (accessed 8 Apr 2017). PReS. Paediatric Rheumatology European Society. http://www.pres.eu/ (accessed 8 Apr 2017).
. Measures for adult and juvenile dermatomyositis, polymyositis, and inclusion body myositis. Arthritis Care Red 2013;63:118–57. Cure JM Foundation. http://www.curejm.org/ (accessed 8 Apr 2017). Myositis UK. http://www.myositis.org.uk/ (accessed 8 Apr 2017).
. Paediatric idiopathic inflammatory muscle disease: recognition and management. Drugs 2005;65:1355–65.
. Proposed preliminary core set measures for disease outcome assessment in adult and juvenile idiopathic inflammatory myopathies. Rheumatology 2001;40:1262–73.
. Distinction of quality of life, health related quality of life, and health status in children referred for rheumatologic care. J Rheumatol 2000;27:226–33. Contributors LJM has led all parts of the study including background work, preparation of the protocol, ethics submissions, content of surveys, planning of consensus meeting, testing the dataset and writing the manuscript. CAP, AMH, AR and LRW, as members of the steering committee, have provided intellectual input and practical help into all parts of the study including background work, protocol development, Delphi survey, planning of the consensus meeting, reviewing results, refining the dataset and preparing the manuscript. AMH, AR and CAP also tested the dataset in practice. DA developed the bespoke Delphi system and provided IT support for the study including data analysis. JJK participated in the study design, was responsible for testing the Delphi system, performed the statistical analysis, helped prepare for the consensus meeting, and was involved in reviewing results and preparing the manuscript. PRW has provided expert advice on study design and Delphi methodology and analysis. AA, LC-S, TC, BMF, IL, SM, PM, RM, LMP, AMR, LGR, AvRK, RR and SS attended the consensus meeting and had intellectual input into the study. In addition, AA, AvRK, LMP, LGR and RR tested the dataset in practice. MWB has been responsible for intellectual and financial overview of the study, input into the protocol development and as a member of the steering committee has provided intellectual input into the Delphi survey and consensus meeting, reviewing results, facilitating the consensus meeting, refining the dataset and preparing the manuscript. Funding This work was supported by Arthritis Research UK (grant number 20417); January 2014–July 2017. The UK JDM Cohort and Biomarker study has been supported by generous grants from the Wellcome Trust UK (085860), Action Medical Research UK (SP4252), The Myositis Support Group UK, Arthritis Research UK (14518), The Henry Smith Charity. LRW’s work is supported in part by Great Ormond Street Children’s Charity, the GOSH/ICH NIHR funded Biomedical Research Centre (BRC) and Arthritis Research UK. The JDM Cohort study is adopted onto the Comprehensive Research Network through the Medicines for Children Research Network (www.mcrn.org.uk) and is supported by the GOSH/ICH Biomedical Research Centre. LGR was supported in part by the Intramural Research Program of the National Institute of Environmental Health Sciences National Institutes of Health. Competing interests IEL has research grants from Astra Zeneca and Bristol Myers Squibb and has served on advisory board for Bristol Myers Squibb. Ethics approval Ethical approval for the study was obtained from the IPHS Research Ethics Committee (reference IPHS-1314-321). The NHS Research Ethics Committee approved final questionnaires, consent/assent forms and patient/parent information leaflets (NRES Committee East Midlands, reference 14/EM/1259; IRAS project ID 160667). Data sharing statement All data for this study are held securely within the University of Liverpool. There are no unpublished data openly available. A URL has been established at Liverpool University to hold the published dataset forms as described within the manuscript. Collaborators International Myositis Assessment and Clinical Studies group (IMACS), Paediatric Rheumatology INternational Trials Organisation (PRINTO at www.printo.it), Juvenile Dermatomyositis Research Group (JDRG) UK and Ireland, Childhood Arthritis and Rheumatology Research Alliance (CARRA), Paediatric Rheumatology European Society (PReS) JDM working group, Euromyositis Steering Committee, Core Outcome Measures in Effectiveness Trials (COMET) and Outcome Measures in Rheumatology (OMERACT) groups. A full list of contributors to the JDCBS can be found on the JDRG website (http://www.juveniledermatomyositis.org.uk).